After students in my Holistic Health class at San Francisco State University practiced slower diaphragmatic breathing and begun to change their dysfunctional shallow breathing, gasping, sighing, and breath holding to diaphragmatic breathing. A number of the older female students students reported that their hot flashes decreased. Some of the younger female students reported that their menstrual cramps and discomfort were reduced by 80 to 90% when they laid down and breathed slower and lower into their abdomen. The recent study in JAMA reported that many women continue to experience menopausal triggered hot flashes for up to 14 years. Although the article described the frequency and possible factors that were associated with the prolonged hot flashes, it did not offer helpful solutions. Yet, there is hope besides hormone replacement therapy (HRT) for women who suffer from hot flashes during menopause. The general accepted hypothesis that the drop in estrogen triggers hot flashes is incomplete. If lowering of estrogen was the main culprit then all older post-menopausal women should have more and more hot flashes–they do not! And, all women going through menopause should suffer; however, 20% of women go through menopause without much discomfort and very few hot flashes. Another understanding of the dynamics of hot flashes is that the decrease in estrogen accentuates the sympathetic/ parasympathetic imbalances that probably already existed. Then any increase in sympathetic activation can trigger a hot flash. In many cases the triggers are events and thoughts that trigger a stress response, emotional responses such as anger, anxiety, or worry, increase caffeine intake and especially shallow chest breathing punctuated with sighs. Approximately 80% of American women tend to breathe thoracically often punctuated with sighs and these women are more likely to experience hot flashes. On the other hand, the 20% of women who habitually breathe diaphragmatically tend to have fewer and less intense hot flashes and often go through menopause without any discomfort. In the superb study Drs. Freedman and Woodward (1992), taught women who experience hot flashes to breathe slowly and diaphragmatically which increased their heart rate variability as an indicator of sympathetic/parasympathetic balance and most importantly it reduced the the frequency and intensity of hot flashes by 50%. Take a breath into your chest and rapidly exhale with a sigh. Repeat this quickly five times. 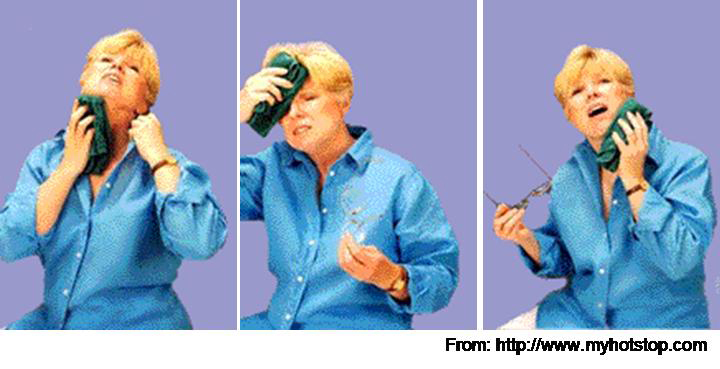 In most cases, one minute later you will experience the beginning sensations of a hot flash. Similarly, when you practice slow diaphragmatic breathing throughout the day and interrupt every gasp, breath holding moment, sigh or shallow chest breathing with slower diaphragmatic breathing, you will experience a significant reduction in hot flashes. Although this breathing approach has been well documented, many people are unaware of this simple behavioral approach unlike the common recommendation for the hormone replacement therapies (HRT) to ameliorate menopausal symptoms. This is not surprising since pharmaceutical companies spent nearly five billion dollars per year in direct to consumer advertising for drugs and very little money is spent on advertising behavioral treatments. There is no profit for pharmaceutical companies teaching effortless diaphragmatic breathing unlike prescribing HRTs. In addition, teaching and practicing diaphragmatic breathing takes skill training and practice time–time which is not reimbursable by third party payers. For more information, research data and breathing skills to reduce hot flash intensity, see our article which is reprinted below. Women have been troubled by hot flashes and premenstrual syndrome for ages. Hormone replacement therapy, historically the most common treatment for hot flashes, and other pharmacological approaches for pre-menstrual syndrome (PMS) appear now to be harmful and may not produce significant benefits. This paper reports on a model treatment approach based upon the early research of Freedman & Woodward to reduce hot flashes and PMS using biofeedback training of diaphragmatic breathing, relaxation, and respiratory sinus arrhythmia. Successful symptom reduction is contingent upon lowering sympathetic arousal utilizing slow breathing in response to stressors and somatic changes. We strongly recommend that effortless diaphragmatic breathing be taught as the first step to reduce hot flashes and PMS symptoms. Women have been troubled by hot flashes and premenstrual syndrome for ages. Hot flashes often result in red faces, sweating bodies, and noticeable and embarrassing discomfort. They come in the middle of meetings, in the middle of the night, and in the middle of romantic interludes. Premenstrual syndrome also arrives without notice, bringing such symptoms as severe mood swings, anger, crying, and depression. Hormone replacement therapy (HRT) was the most common treatment for hot flashes for decades. However, recent randomized controlled trials show that the benefits of HRT are less than previously thought and the risks—especially of invasive breast cancer, coronary artery disease, dementia, stroke and venous thromboembolism—are greater (Humphries & Gill, 2003; Shumaker, et al, 2003; Wassertheil-Smoller, et al, 2003). In addition, there is no evidence of increased quality of life improvements (general health, vitality, mental health, depressive symptoms, or sexual satisfaction) as claimed for HRT (Hays et al, 2003). Because of the increased long-term risk and lack of benefit, many physicians are weaning women off HRT at a time when the largest population of maturing women in history (‘baby boomers’) is entering menopausal years. The desire to find a reliable remedy for hot flashes is on the front burner of many researchers’ minds, not to mention the minds of women suffering from these ‘uncontrollable’ power surges. Yet, many women are becoming increasingly leery of the view that menopause is an illness. There is a rising demand to find a natural remedy for this natural stage in women’s health and development. For younger women a similar dilemma occurs when they seek treatment of discomfort associated with their menstrual cycle. Is premenstrual syndrome (PMS) just a natural variation in energy and mood levels? Or, are women expected to adapt to a masculine based environment that requires them to override the natural tendency to perform in rhythm with their own psychophysiological states? Instead of perceiving menstruation as a natural occurrence in which one has different moods and/or energy levels, women in our society are required to perform at the status quo, which may contribute to PMS. The feelings and mood changes are quickly labeled as pathology that can only be treated with medication. For both hot flashes and PMS the biomedical model tends to frame the symptoms as a “structural biological problem.” Namely, the pathology occurs because the body is either lacking in, or has an excess of, some hormone. All that needs to be done is either augment or suppress hormones/symptoms with some form of drug. Recently, for example, medicine has turned to antidepressant medications to address menopausal hot flashes (Stearns, Beebe, Iyengar, & Dube, 2003). The biomedical model, however, is only one perspective. The opposite perspective is that the dysfunction occurs because of how we use ourselves. Use in this sense means our thoughts, emotions and body patterns. As we use ourselves, we change our physiology and, thereby, may affect and slowly change the predisposing and maintaining factors that contribute to our dysfunction. By changing our use, we may reduce the constraints that limit the expression of the self-healing potential that is intrinsic in each person. The intrinsic power of self-healing is easily observed when we cut our finger. Without the individual having to do anything, the small cut bleeds, clotting begin and tissue healing is activated. Obviously, we can interfere with the healing process, such as when we scrape the scab, rub dirt in the wound, reduce blood flow to the tissue or feel anxious or afraid. Conversely, cleaning the wound, increasing blood flow to the area, and feeling “safe” and relaxed can promote healing. Healing is a dynamic process in which both structure and use continuously affect each other. It is highly likely that menopausal hot flashes and PMS mood swings are equally an interaction of the biological structure (hormone levels) and the use factor (sympathetic/parasympathetic activation). Are the hot flashes and PMS mood swings really ‘uncontrollable?’ From a physiological perspective, hot flashes are increased by sympathetic arousal. When the sympathetic system is activated, whether by medication or by emotions, hot flashes increase and similarly, when sympathetic activity decreases hot flashes decrease. Equally, PMS, with its strong mood swings, is aggravated by sympathetic arousal. There are many self-management approaches that can be mastered to change and reduce sympathetic arousal, such as breathing, meditation, behavioral cognitive therapy, and relaxation. Breathing patterns are closely associated with hot flashes. During sleep, a sigh generally occurs one minute before a hot flash as reported by Freedman and Woodward (1992). Women who habitually breathe thoracically (in the chest) report much more discomfort and hot flashes than women who habitually breathe diaphragmatically. Freedman, Woodward, Brown, Javaid, and Pandey (1995) and Freedman and Woodward (1992) found that hot flash rates during menopause decreased in women who practiced slower breathing for two weeks. In their studies, the control groups received alpha electroencephalographic feedback and did not benefit from a reduction of hot flashes. Those who received training in paced breathing reduced the frequency of their hot flashes by 50% when they practiced slower breathing. This data suggest that the slower breathing has a significant effect on the sympathetic and parasympathetic balance. Women with PMS appear similarly able to reduce their discomfort. An early study utilizing Autogenic Training (AT) combined with an emphasis on warming the lower abdomen resulted in women noting improvement in dysfunctional bleeding (Luthe & Schultz, 1969, pp. 144-148). Using a similar approach, Mathew, Claghorn, Largen, and Dobbins (1979) and Dewit (1981) found that biofeedback temperature training was helpful in reducing PMS symptoms.. A later study by Goodale, Domar, and Benson (1990) found that women with severe PMS symptoms who practiced the relaxation response reported a 58% improvement in overall symptomatology as compared to a 27.2% improvement for the reading control group and a 17.0% improvement for the charting group. Teaching women to breathe effortlessly can lead to positive results and an enhanced sense of control. By effortless breathing, the authors refer to their approach to breath training, which involves a slow, comfortable respiration, larger volume of air exchange, and a reliance upon action of the muscles of the diaphragm rather than the chest (Peper, 1990). For more instructions see the recent blog, A breath of fresh air: Improve health with breathing. Slowing breathing helps to limit the sighs common to rapid thoracic breathing—sighs that often precede menopausal hot flashes. Effortless breathing is associated with stress reduction—stress and mood swings are common concerns of women suffering from PMS. In a pilot study Bier, Kazarian, Peper, and Gibney (2003) at San Francisco State University (SFSU) observed that when the subject practiced diaphragmatic breathing throughout the month, combined with Autogenic Training, her premenstrual psychological symptoms (anger, depressed mood, crying) and premenstrual responses to stressors were significantly reduced as shown in Figure 1. Figure 1. Student’s Individual Subjective Rating in Response to PMS Symptoms. In another pilot study at SFSU, Frobish, Peper, and Gibney (2003) trained a volunteer who suffered from frequent hot flashes to breathe diaphragmatically. The training goals included modifying breathing patterns, producing a Respiratory Sinus Arrhythmia (RSA), and peripheral hand warming. RSA refers to a pattern of slow, regular breathing during which variations in heart rate enter into a synchrony with the respiration. Each inspiration is accompanied by an increase in heart rate, and each expiration is accompanied by a decrease in heart rate (with some phase differences depending on the rate of breathing). The presence of the RSA pattern is an indication of optimal balance between sympathetic and parasympathetic nervous activity. During the 11-day study period, the subject charted the occurrence of hot flashes and noted a significant decrease by day 5. However, on the evening of day 7 she sprained her ankle and experienced a dramatic increase in hot flashes on day 8. Once the subject recognized her stress response, she focused more on breathing and was able to reduce the flashes as shown in Figure 2. Figure 2. Subjective rating of intensity, frequency and bothersomeness of hot flashes. 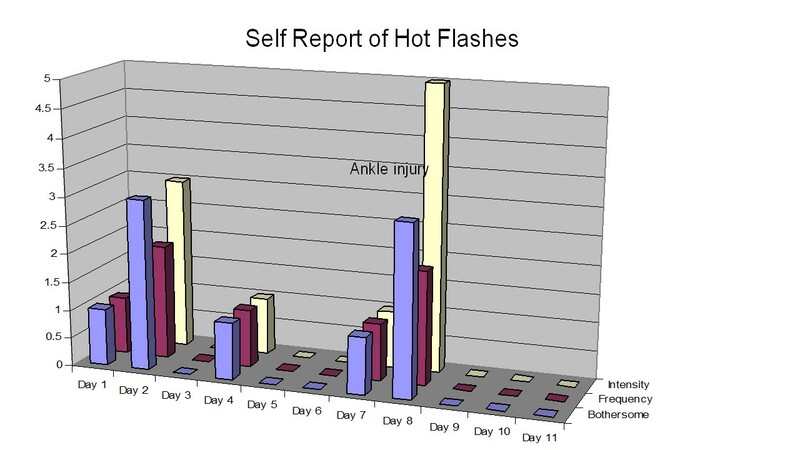 The increase in hot flashes coincided with increased frustration about an ankle injury. Our clinical experience confirms the SFSU pilot studies and the previously referenced research by Freedman and Woodward (1992) and Freedman et al. (1995). When arousal is lowered and breathing is effortless, women are better able to cope with stress and report a reduction in symptoms. Habitual rapid thoracic breathing tends to increase arousal while slower breathing, especially slower exhalation, tends to relax and reduce arousal. Learning and then applying effortless breathing reduces excessive sympathetic arousal. It also interrupts the cycle of cognitive activation, anxiety, and somatic arousal. The anticipation and frustration at having hot flashes becomes the cue to shift attention and “breathe slower and lower.” This process stops the cognitively mediated self-activation. Successful self-regulation and the return to health begin with cognitive reframing: We are not only a genetic biological fixed (deficient) structure but also a dynamic changing system in which all parts (thoughts, emotions, behavior, diet, stress, and physiology) affect and are effected by each other. Within this dynamic changing system, there is an opportunity to implement and practice behaviors and life patterns that promote health. Although there are many strategies to modify respiration, biofeedback monitoring combined with respiration training is very useful as it provides real-time feedback. Chest and abdominal movement are recorded with strain gauges and heart rate can be monitored either by an electrocardiogram (EKG) or by a photoplethysmograph sensor on a finger or thumb. Peripheral temperature and electrodermal activity (EDA) biofeedback are also helpful in training. The training focuses on teaching effortless diaphragmatic breathing and encouraging the participant to practice many times during the day, especially when becoming aware of the first sensations of discomfort. Learning and integrating effortless diaphragmatic breathing into daily life is one of the biofeedback strategies that has been successfully used as a primary or adjunctive/complementary tool for the reversal of disorders such as hypertension, migraine headaches, repetitive strain injury, pain, asthma and anxiety (Schwartz & Andrasik, 2003), as well as hot flashes and PMS. Observe & identify: Dysfunctional rapid thoracic breathing patterns, especially in response to stressors, are clearly displayed in real-time feedback. Demonstrate & train: The physiological feedback display helps the person see that she is breathing rapidly and shallowly in her chest with episodic sighs. Coaching with feedback helps her to change her breathing pattern to one that promotes a more balanced homeostasis. Motivate, persuade and change beliefs: The person observes her breathing patterns change concurrently with a felt shift in physiology, such as a decrease in irritability, or an increase in peripheral temperature, or a reduction in the incidence of hot flushes. Thus, she has a confirmation of the importance of breathing diaphragmatically. Imagine that you are holding a baby. Now with your shoulders relaxed, inhale gently so that your abdomen widens. Then as you exhale, purse your lips and very gently and softly blow over the baby’s hair. Allow your abdomen to narrow when exhaling. Blow so softly that the baby’s hair barely moves. At the same time, imagine that you can allow your breath to flow down and through your legs. Continue imagining that you are gently blowing on the baby’s hair while feeling your breath flowing down your legs. Keep blowing very softly and continuously. Practice exhaling like this the moment that you feel any sensation associated with hot flashes or PMS symptoms. Smile sweetly as you exhale. Sit or lie comfortably with your feet a shoulder width apart. As you exhale softly whisper the sound “Haaaaa….” Or, very gently press your tongue to your pallet and exhale while making a very soft hissing sound. Have your partner touch the side of your thighs. As you exhale have your partner stroke down your thighs to your feet and beyond, stroking in rhythm with your exhalation. Do not rush. Apply gentle pressure with the stroking. Do this for four or five breaths. Now, continue breathing as you imagine your breath flowing through your legs and out your feet. During the day remember the feeling of your breath flowing downward through your legs and out your feet as you exhale. Master effortless diaphragmatic breathing, and concurrently increase respiratory sinus arrhythmia (RSA). Instead of breathing rapidly, such as at 18 breaths per minute, the person learns to breathe effortlessly and slowly (about 6 to 8 breaths per minute). This slower breathing and increased RSA is an indication of sympathetic-parasympathetic balance as shown in Figure 3. Practice slow effortless diaphragmatic breathing many times during the day and, especially in response to stressors. Use the physical or emotional sensations of a hot flash or mood alteration as the cue to exhale, let go of anxiety, breathe diaphragmatically and relax. Reframe thoughts by accepting the physiological processes of menstruation or menopause, and refocus the mind on positive thoughts, and breathing rhythmically. Change one’s lifestyle and allow personal schedules to flow in better balance with individual, dynamic energy levels. Figure 3. 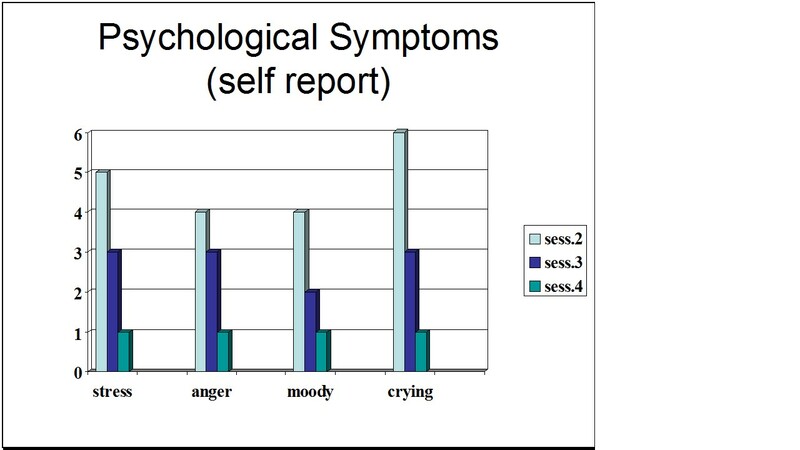 Physiological Recordings of a Participant with PMS. This subject learned effortless diaphragmatic breathing by the fifth session and experienced a significant decrease in symptoms. The limits of self-regulation are unknown, often held back only by the practitioner’s and participant’s beliefs. Biofeedback is a powerful self-regulation tool for individuals to observe and modify their covert physiological reactions. Other skills that augment diaphragmatic breathing are Quieting Reflex (Stroebel, 1982), Autogenic Training (Schultz & Luthe, 1969), and mindfulness training (Kabat-Zinn, 1990). In all skill learning, generalization is a fundamental factor underlying successful training. Integrating the learned psychophysiological skills into daily life can significantly improve health—especially in anticipation of and response to stress. The anticipated stress can be a physical, cognitive or social trigger, or merely the felt onset of a symptom. As the person learns and applies effortless breathing to daily activities, she becomes more aware of factors that affect her breathing. She also experiences an increased sense of control: She can now take action (a slow effortless breath) in moments when she previously felt powerless. The biofeedback-mastered skill interrupts the evoked frustrations and irritations associated with an embarrassing history of hot flashes or mood swings. Instead of continuing with the automatic self-talk, such as “Damn, I am getting hot, why doesn’t it just stop?” (language fueling sympathetic arousal), she can take a relaxing breath in response to the internal sensations, stop the escalating negative self-talk and allows more acceptance—a process reducing sympathetic arousal. In summary, effortless breathing appears to be a non-invasive behavioral strategy to reduce hot flashes and PMS symptoms. Practicing effortless diaphragmatic breathing contributes to a sense of control, supports a healthier homeostasis, reduces symptoms, and avoids the negative drug side effects. We strongly recommend that effortless diaphragmatic breathing be taught as the first step to reduce hot flashes and PMS symptoms. Bier, M., Kazarian, D., Peper, E., & Gibney, K. (2003). Reducing the severity of PMS symptoms with diaphragmatic breathing, autogenic training and biofeedback. Unpublished report. Freedman, R.R., & Woodward, S. (1992). Behavioral treatment of menopausal hot flushes: Evaluation by ambulatory monitoring. American Journal of Obstetrics and Gynecology, 167 (2), 436-439. Freedman, R.R., Woodward, S., Brown, B., Javaid, J.I., & Pandey, G.N. (1995). Biochemical and thermoregulatory effects of behavioral treatment for menopausal hot flashes. Menopause: The Journal of the North American Menopause Society, 2 (4), 211-218. Frobish,C., Peper, E. & Gibney, K. H. (2003). Menopausal Hot Flashes: A Self-Regulation Case Study. Poster presentation at the 35th Annual Meeting of the Association for Applied Psychophysiology and Biofeedback. Abstract in: Applied Psychophysiology and Biofeedback. 29 (4), 302. Goodale, I.L., Domar, A.D., & Benson, H. (1990). Alleviation of Premenstrual Syndrome symptoms with the relaxation response. Obstetrics and Gynecological Journal, 75 (5), 649-55. Hays, J., Ockene, J.K., Brunner, R.L., Kotchen, J.M., Manson, J.E., Patterson, R.E., Aragaki, A.K., Shumaker, S.A., Brzyski, R.G., LaCroix, A.Z., Granek, I.A, & Valanis, B.G., Women’s Health Initiative Investigators. (2003). Effects of estrogen plus progestin on health-related quality of life. New England Journal of Medicine, 348, 1839-1854. Humphries, K.H.., & Gill, s. (2003). Risks and benefits of hormone replacement therapy: the evidence speaks. Canadian Medical Association Journal, 168(8), 1001-10. Kabat-Zinn, J. (1990). Full catastrophe living. New York: Dela­corte Press. Luthe, W. & Schultz, J.H. (1969). Autogenic therapy: Vol II: Medical applications. New York: Grune & Stratton. Mathew, R.J.; Claghorn, J.L. ; Largen, J.W. ; & Dobbins, K. (1979). Skin Temperature control for premenstrual tension syndrome:A pilot study. American Journal of Clinical Biofeedback, 2 (1), 7-10. Peper, E. (1990). Breathing for health. Montreal: Thought Tech­nology Ltd.
Schultz, J.H., & Luthe, W. (1969). Autogenic therapy: Vol 1. Autogenic methods. New York: Grune and Stratton. Schwartz, M.S. & Andrasik, F.(2003). Biofeedback: A practitioner’s guide, 3nd edition. New York: Guilford Press. Shumaker, S.A., Legault, C., Thal, L., Wallace, R.B., Ockene, J., Hendrix, S., Jones III, B., Assaf, A.R., Jackson, R. D., Morley Kotchen, J., Wassertheil-Smoller, S.; & Wactawski-Wende, J. (2003). Estrogen plus progestin and the incidence of dementia and mild cognitive impairment in post menopausal women: The Women’s Health Initiative memory study: A randomized controlled trial. Journal of the American Medical Association, 289 (20), 2651-2662. Stearns, V., Beebe, K. L., Iyengar, M., & Dube, E. (2003). Paroxetine controlled release in the treatment of menopausal hot flashes. Journal of the American Medical Association, 289 (21), 2827-2834. Stroebel, C. F. (1982). QR, the quieting reflex. New York: G. P. Putnam’s Sons. van Dixhoorn, J.J. (1998). Ontspanningsinstructie Principes en Oefeningen (Respiration instructions: Principles and exercises). Maarssen, Netherlands: Elsevier/Bunge. Wassertheil-Smoller, S., Hendrix, S., Limacher, M., Heiss, G., Kooperberg, C., Baird, A., Kotchen, T., Curb, Dv., Black, H., Rossouw, J.E., Aragaki, A., Safford, M., Stein, E., Laowattana, S., & Mysiw, W.J. (2003). Effect of estrogen plus progestin on stroke in postmenopausal women: The Women’s Health Initiative: A randomized trial. Journal of the American Medical Association, 289 (20), 2673-2684. Wyeth Pharmaceuticals (2003, June 4). A message from Wyeth: Recent reports on hormone therapy and where we stand today. San Francisco Chronicle, A11. *We thank Candy Frobish, Mary Bier and Dalainya Kazarian for their helpful contributions to this research.